Scheda: Nazione: USA-Olanda - Produzione: Dino De Laurentiis Productions, Famous Films N.V. - Distribuzione: Filmauro, Cecchi Gori Home Video, Metro-Goldwyn-Mayer - Soggetto: dai racconti di Robert E. Howard - Sceneggiatura: Clive Exton, George MacDonald Fraser - Fotografia: Frank J. Urioste - Montaggio: David W. Griffith, James Smith, Rose Smith - Scenografia: Gianni Giovagnoni - Costumi: Danilo Donati - Musiche: Ennio Morricone - Effetti speciali: John K. Stirber, Bruno Van Zeebroeck - Formato: Scope Metrocolor - Durata: 89'. Cast: Arnold Schwarzenegger, Brigitte Nielsen, Sandahl Bergman, Paul L. Smith, Ernie Reyes jr., Ronald Lacey, Pat Roach, Terry Richards, Janet Agren, Donna Osterbuhr, Lara Naszinsky, Hans Meyer, Francesca Romana Coluzzi, Stefano Maria Mioni, Tutte Lemkow, Kiyoshi Yamasak, Tad Horino. Trama e commenti: cinematografo.it - mymovies.it - vivoscuola.it - ilm.spettacolo.virgilio.it - schwarzenegger.it: «Chi è Sonja la Rossa? Un'eroina del remoto futuro, una specie di Conan in gonnella, dotata di forza sovrumana e di grande abilità nella scherma. Nata dalla fantasia di Robert Howard, l'autore di Conan, Sonja è a sua volta, dopo il successo librario, divenuta protagonista di una serie di fumetti di grande successo. Dino De Laurentis e Richard Fleischer, produttore e regista anche di Conan hanno portato al cinema Sonja nella sua avventura più famosa, la lotta contro la malvagia regina. ... Al suo fianco Arnold Schwarzenegger nella parte di Yado, il guerriero che prima...». Plot Summary, Synopsis, Review: IMDb - entertainment.msn.com - tvguide.com - rottentomatoes.com: «Red Sonja is a semisequel to Conan the Barbarian and Conan the Destroyer. Like those two movies, the film is directed by Richard Fleischer and based on characters created by sword-and-sorcery writer Robert E. Howard. After suffering at the hands of Queen Gedren (Sandahl Bergman), warrior Red Sonja (Brigitte Nielsen) seeks vengeance. When the queen seizes a talisman that yields immense power, Sonja sets out to thwart her. 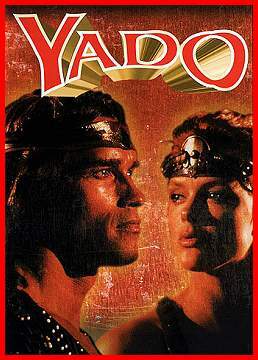 On her journey, Sonja is aided by the mysterious Kalidor (Arnold Schwarzenegger), and meets the 12-year-old Prince Tarn (Eddie Reyes, Jr.) and his bodyguard, Falkon (Paul Smith). After many trials, the quartet arrives in the Land of Perpetual Night where they confront Queen Gedren in her stronghold. Less violent than Conan the Barbarian, Red Sonja is more brutal than Conan the Destroyer. The film features a contest between Kalidor and Red Sonja--she has vowed never to give herself to a man unless he defeats her in a fair fight. Comic relief is provided by the young Prince Tarn as he tires of watching their extended battle with very big swords. Fleischer is an old hand at directing flamboyant swordplay, and he keeps the action moving to the film's explosive finale».